A serious weightlifter ought to have squats as part of his weight training plan. So when I finished building my weight plates and dumbbells rack, primarily for storage purposes, I embarked on a project to build squat stands. For this, I turned to the internet for ideas on how to build homemade squat stands. I wasn't particularly looking for gym equipment designs, but rather setups that other folks have implemented to allow them to safely squat at home. In my internet search, I encountered a couple of improvised barbell setups that truly aroused interest, but in a rather disturbing manner. The barbell is heavy enough to cause damage. The barbell plate shown on one end is 45 lbs. Although the floor is carpeted, the barbell has the potential of damaging property in case it falls or is swung incorrectly. There are music and electronic instruments all around it that can easily get damaged. Speakers aren't exactly the best supports for a heavy barbell. The speaker box is there to contain the speaker and wirings inside and not much else. The box is likely made up of lightweight wood or particle board. It can easily collapse if a heavy barbell is dropped on it. There are only towels on top of the speakers that keep the round barbell plates from rolling away. A little slip from any one weight plate and the entire barbell will come crashing down. Here's a tip to prevent barbells and dumbbells from rolling away when set on a flat surface. The low ceiling and overhead light fixtures doesn't leave much space for standing barbell presses. The second photo above shows an improvised barbell setup in a bedroom. 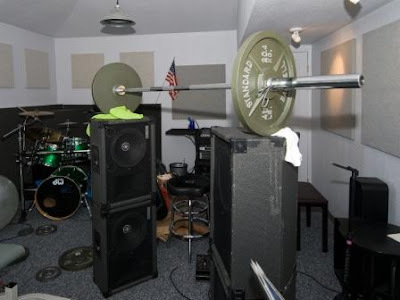 I too have worked out in a spare bedroom before, but this was after I already built my dumbbell and weight plate rack as well as the wooden squat stands. Here are my comments on the above. There are only magazines keeping the round plates from rolling away. Again, use rubber tiles to secure weight plates on flat surfaces. Anytime a heavy barbell falls, you can be assured of some damage. There's nothing covering the beautiful wooden parquet floor. Rubber mats can do wonders to protect your expensive floor. With a barbell set up like that, there's hardly any walking space around. 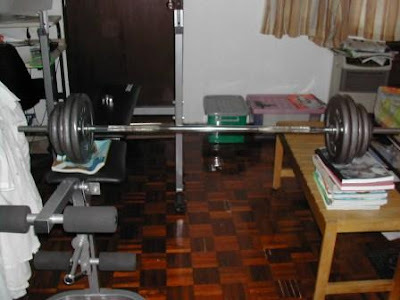 So as not to take up too much space, a barbell is best positioned near a wall and not in the center of a room. Simply put, the above improvised barbell setups cry out for comments. It's a bit of relief when I found they were TEMPORARY setups and the owners eventually found better and safer alternatives.